Waterfront properties are coveted for their views, but can often come with a major trade-off: flood damage. Baca Architects mitigated that danger with their recently completed family home, an innovative dwelling that they call the UK’s “first amphibious house.” Located on the banks of the River Thames in Buckinghamshire’s town of Marlow, the flood-resistant Amphibious House is designed to float and rise with the water levels during times of flooding. Clad in zinc shingles and ample high-performance glazing, the unique waterfront home rests on fixed foundations that are separated to allow the structure to float upwards when the River Thames overflows its banks. Here’s how it works: as floodwaters fill the fixed “dock” beneath the three-bedroom home, the water levels push the buoyant house upwards. To ensure that the home doesn’t float away, the structure is attached to four guideposts that extend upwards and allow for a 2.5-meter-high floodwater clearance. Though the Amphibious House is located within a Flood Zone 3b area, the site does not experience severe floods regularly. Consequently, the dock will be pumped full of water every five years as part of a flotation test that will raise the house upwards a half meter. 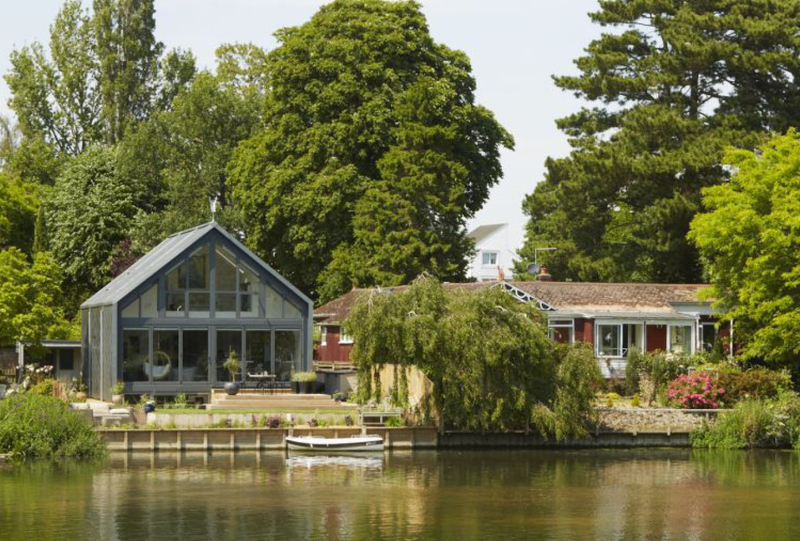 In addition to its unique flood-resistant feature, the innovative and contemporary house also overlooks panoramic views of the River Thames and a small garden that serves as an early-warning system for flooding. Is there a picture or video of the house on thames river flood season? This home featured on Grand Designs UK with Kevin McCloud last year. At the time we thought 'someone is finally thinking `inside' the box ! Clad in zinc shingles and ample high-performance glazing, the unique waterfront home rests on fixed foundations that are separated to allow the structure to float upwards when the River Thames overflows its banks. To ensure that the home doesn’t float away, the structure is attached to four guideposts that extend upwards and allow for a 2.5-meter-high floodwater clearance. "With flooding becoming a regular occurrence in the UK and elsewhere isn't it time we started to learn to live with it?" said Baca Architects, according to Dezeen. "Scientists appear to agree that the sort of weather we have seen over the last few weeks is likely to become much more prevalent. If this is the case then maybe we need to be a bit more proactive in building in measures to cope with flooding if it does occur rather than hoping that the flood defenses will protect people." Though the Amphibious House is located within a Flood Zone 3b area, the site does not experience severe floods regularly. Consequently, the dock will be pumped full of water every five years as part of a flotation test that will raise the house upwards a half meter. 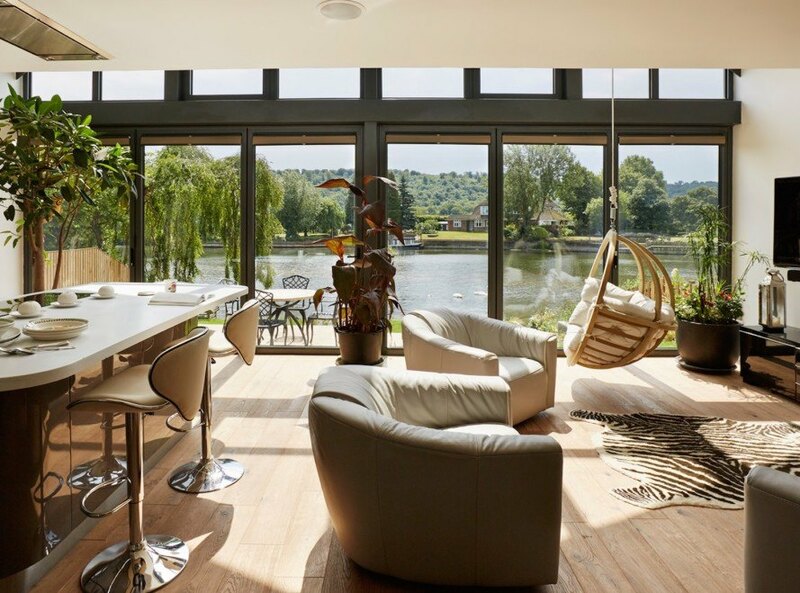 In addition to its unique flood-resistant feature, the innovative and contemporary house also overlooks panoramic views of the River Thames and a small garden that serves as an early-warning system for flooding.